Plot synopsis: A pair of newlyweds embarks on an ocean voyage to begin their European honeymoon, but when the husband disappears, the wife struggles to persuade anyone else on board that he even exists. Based on an original script by John Dickson Carr (with the story subsequently published in Ellery Queen's Mystery Magazine, in May 1944; and later in his short-story collection The Door to Doom and Other Detections, in 1980). Review: This ship-based story uses the same basic plot as Alfred Hitchcock's The Lady Vanishes, though the latter takes place aboard a train (and completing the set of land, sea and air versions, the plot is recycled again in the film Flightplan, which transplants the action to a plane). The episode was written by the detective-story writer John Dickson Carr, who scripted a number of Suspense stories, and this is one of the best-known of his works for the series. The-set up is a winner, which any fan of mysteries will find involving. How can a person simply disappear from a closed environment like a ship? Why does no one but the heroine remember him? Is she somehow mistaken, or perhaps even losing her mind? There is some good misdirection about the answers to these questions, and the conclusion is surprising and effective. There are, though, some flaws. Most notable, it's a shame that the heroine is a fairly weak, passive protagonist - whereas Margaret Lockwood in The Lady Vanishes and Jodi Foster in Flightplan get to play quite proactive leads, in this story, Margo's character contributes little to the mystery's solution. Instead, it is left to the ship's doctor to unravel it - and to provide a great deal of the episode's exposition - which isn't as satisfying as if the heroine had worked out at least some of it for herself. Also, the foreshadowing of the plot at the start is extremely unsubtle, with Margo's character recounting, for no clear reason, the story of a daughter whose mother disappears while they are visiting Paris, with the authorities then covering up all trace of her existence. Unless the heroine of this episode is psychic, it's a rather odd coincidence that she is thinking about precisely this story just before she is about to experience a similar sort of disappearance herself. Despite these caveats, this is a strong episode. Plot synopsis: Trapped in a hotel room with his mentally unstable wife, a man must convince his spouse not to shoot him. Review: It's amazing how many Suspense characters are, or have been, committed to mental institutions, and this episode presents yet another. In this case, though, the person who has been placed in one is not a murderous psychopath, but an ordinary woman driven to mental breakdown by personal tragedy: the loss of a child. This gives the episode a degree of emotional depth, even pathos, not always found in more conventional Suspense crime stories. The episode is largely a two-hander, and both actors give solid performances. The plot does rely on some pretty simplistic psychology (concerning the sound of ringing bells), but the story is otherwise a tense and enjoyable one. Plot synopsis: A man obsessed with his ex-girlfriend, who wants nothing more to do with him, decides on a course of action that will get her out of his mind for good. Review: Both written by and starring Elliott Lewis, this episode is strong in terms of atmosphere, but nothing out of the ordinary when it comes to plot. The way the story is structured means that there are no surprises as to how it ends - I won't reveal any details, but we know from very early on what happens to both the protagonist and his ex. Yet this isn't fatal to the story, as it is more a character study than anything else, with Lewis in fine form as a disturbed and disturbing sociopath. An average episode overall, but then again, even the more unexceptional Suspense episodes often possess sufficient positives to make them worthwhile listens, and this is certainly the case here. Plot synopsis: A gambler whose compulsion means that he is unable to hold down a job and is in danger of losing his wife enters a no-limits poker game in the hope of winning big enough so that he can finally quit gambling for ever. 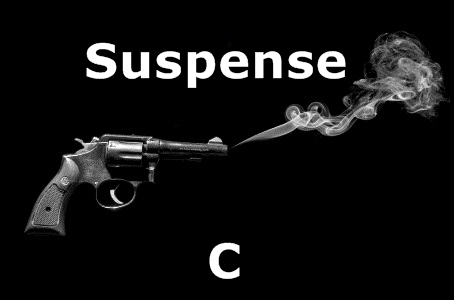 Review: Some Suspense stories don't feel like Suspense stories, which is the case here: there is no crime committed, no real mystery and no unexpected twist at the end. Instead, this is a relatively straightforward drama about an inveterate gambler chasing the one big score that will allow him to give up gambling for good. That's not to say the episode doesn't have merit, as it is solidly constructed and presented. In particular, there are some strong performances, especially by Richard Widmark in the main role. There's very little in the episode that's original - how many stories are there are about deadbeat gamblers who deludedly believe that their luck is just about to change? - and the script isn't spectacular, but there are some nice character moments and a satisfying conclusion. Plot synopsis: A man who pretends to be an emotionless robot as a carnival sideshow attraction begins to contemplate killing the man who has been forcing him to play this role for fifteen long years to escape his soul-destroying existence. Review: Most of us have probably heard of the various 'freaks' and human curiosities that were once staples of the carnival world, but I for one had never before heard of people pretending to be robots as sideshow attractions. Did this really used to be a form of entertainment? And if it was, was anyone truly fooled by the pretence? Regardless, this is an efficient, if not terribly exciting, thriller. The performances are decent and the plot is fine, but it suffers from a clear case of taking itself too seriously. We are supposed to be moved by the inner turmoil of a man who is forced to conceal his emotions as he is made to impersonate a cold, unfeeling automaton, but frankly, the script isn't up to the job of making this work. The main character isn't sympathetic enough to make us care about his plight - he is, as we learn early on, a murderer - and the story never really overcomes the inherent silliness of its central premise. So, not a bad episode by any means, but I might have preferred it if the twist at the end was that the main character turned out actually to be a robot, as this might have shown that the story was willing to embrace the fundamental daftness of its central conceit rather than being quite so earnest and humourless. Plot synopsis: The friendship between a reporter and a Chinese-American gang leader is tested during San Francisco's Tong Wars. Review: Earnest and overwrought, this episode strives to find depth and significance in the relationship between an American reporter and a Chinese-born criminal, but struggles to do either. The depiction of the Tong Wars in San Francisco (a series of violent conflicts between rival Chinese-American gangs that ran from the 1880s-1920s) is largely superficial and the story doesn't do much to explain what they were or why they occurred. Yet what left me almost entirely unmoved and uninterested was the portrayal of the story's main gang leader - the Loo Doc of the title - whom we are supposed to see as a conflicted, ambivalent character, but whom we learn too little about to feel much beyond indifference. A further issue for some may be the fact that he is played not by a Chinese-American actor, but by a white American - William Conrad - though in fairness, Conrad does a pretty good job in the role, without resorting to caricature (compare his performance to, for example, Peter Ustinov's over-the-top, and possibly faintly racist, one in One of Our Dinosaurs Is Missing). Even so, not an episode I would recommend. Plot synopsis: The life and times of a gambler-turned-casino-owner in the Roaring Twenties. Review: This episode has the feel of a very minor B-movie noir. The plot follows a predictable trajectory, charting the rise and fall of its gambler-protagonist in building his casino empire, as fate and hubris conspire to lead him to his final, tragic fate; none of this is a spoiler, as we know from the opening scene that he will ultimately wind up with a bullet in his belly. The story is set in the 1920s, but this is of little relevance, as the script does almost nothing to evoke the time period (it could easily have taken place in the 1950s, when the episode was produced). There are few twists and not much suspense, and the episode has nothing to say about gambling or greed that hasn't been said many times before. Reasonable performances by the cast can't disguise the fact that this is a pedestrian, forgettable episode.